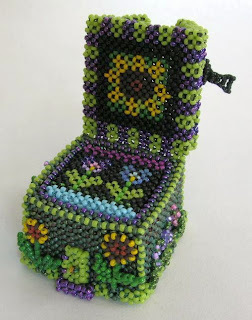 It has been a while since I updated my blog.I have been busy beading several new projects this year. In my last update, I featured my blue beaded peyote parakeet that looked just like my bird Frankie. I am sad to report that Frankie died from a tumor in April. It was quite a shock because he was so young. I now have a new baby parakeet named Jesse. He is nine months old and is already talking. He is yellow and green. 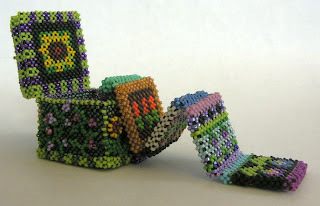 I have not yet immortalized Jesse in beads. I have completed four projects: a bead embroidered fish pincushion, two bracelets, and a right-angle weave greenhouse. I am almost finished with a fifth project: a right-angle weave aquarium. 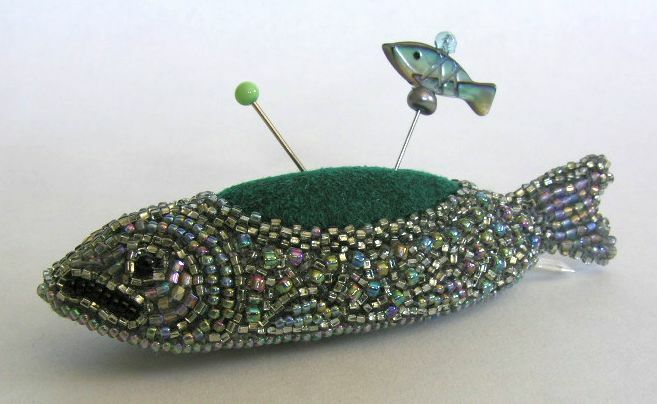 The fish pincushion is bead embroidery. It measures 3 1/4" long by 3/4" wide. It is stitched on gray Ultra Suede. 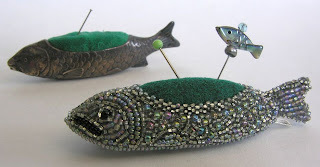 My inspiration for this piece was an antique sterling silver fish pincushion in my collection of antique sewing tools. 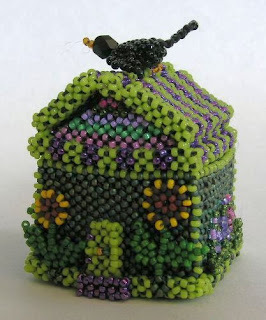 My greenhouse is entirely constructed with size 15/0 seed beads in double sided right-angle weave. The interior strip fills the greenhouse and shows things found in a greenhouse. It measures 1 1/2" x 1 1/2" by 1 3/4" high. A beaded peyote blackbird sits on top of the roof of the greenhouse. 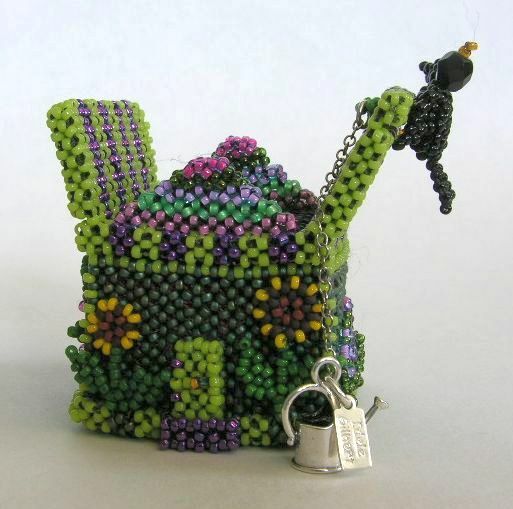 The roof opens and holds a sterling silver watering can with my nametag. This is my original design. 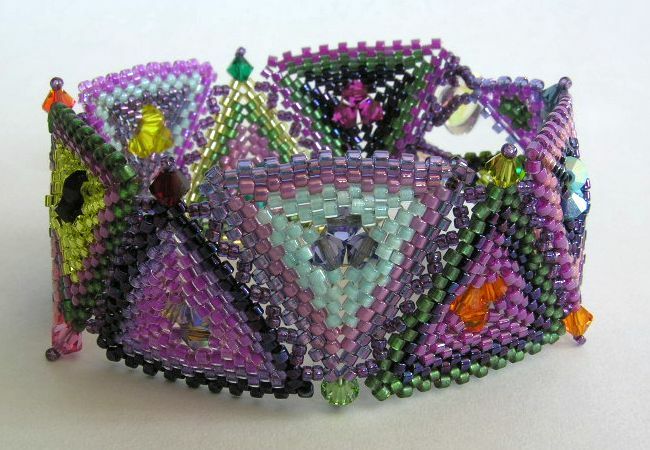 This bracelet is called "Kaleidoscope Cuff" which was designed by Carole Ohl. 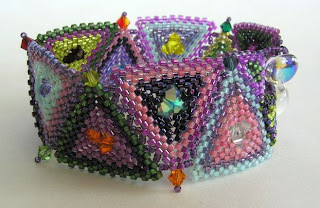 The triangles are worked in Peyote stitch with size 11 Delica beads. It has swarovski crystal beads embellishing the centers and edges of the bracelet. It reminds me of grannie square afghans. 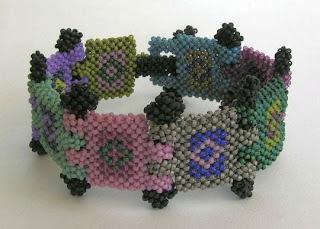 The Medici Cuff bracelet was designed by Hannah Benniger. It is worked in double sided right - angle weave. It is 1 1/4" wide. 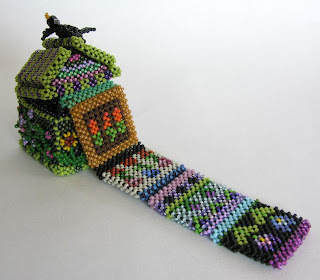 I used all matt 15/0 seed beads for this project. 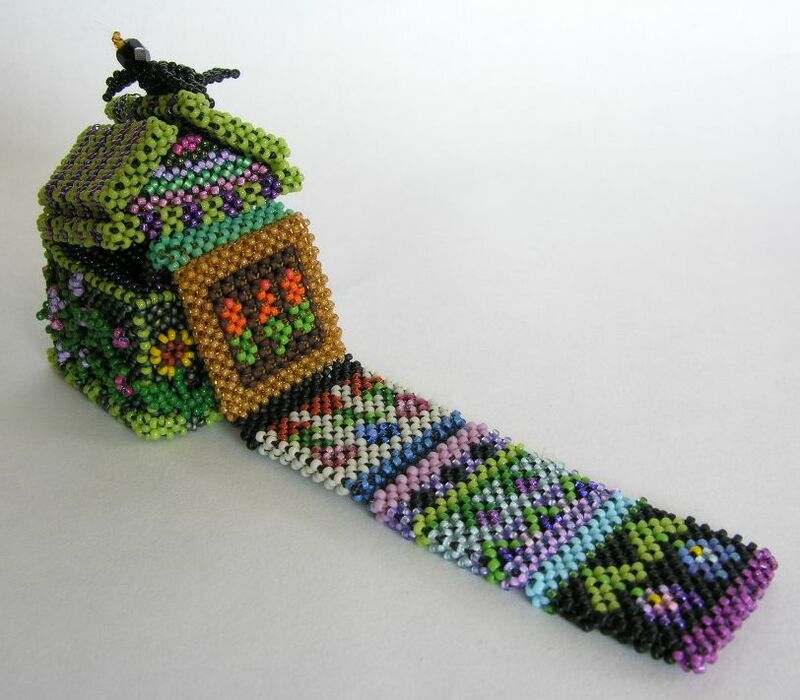 Wow, your work is incredible. I love the fish pin cushion especially. Gorgeous AND functional!